Since 1993, Interfaith Ozaukee has been helping our neighbors age in place with dignity throughout Ozaukee County. As we embark into a new future where more and more seniors need help to stay in their homes, the need for volunteers will only continue to grow. Will you help us help our neighbors? Check out the video below, and learn more about the benefits and impact of volunteering at Interfaith Caregivers of Ozaukee County today! We’re expanding our offerings and presence! Interfaith Ozaukee is host to the Ozaukee HELP corner, lending wheelchairs, walkers and canes free of charge. Click below to learn more! Interfaith Ozaukee is also a proud partner and collaborator on the Ozaukee Initiative, bringing non-profits together with the community to better serve Ozaukee County. Click below to learn more! You can get involved in any number of ways – check below to see what we’re up to! Interfaith Caregivers Ozaukee offers services free-of-charge to clients. 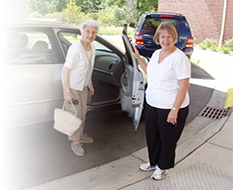 To support our mission of enabling seniors, including those with limited mobility to remain independent in their homes, we rely on generous contributions to support our programs. For additional ways to support Interfaith Caregivers of Ozaukee County, please see donation page. We could not do the work we do, without your support. Sponsoring our events provides you with a way to showcase your organization and support our mission! Get the latest news and happenings about Interfaith Caregivers of Ozaukee County by visiting our FaceBook page! If you click the “Find us on FaceBook” logo, you can press the “like” button on our page so we are always in your Facebook news feed!